The Goethe Institut in Krakow, Poland Audio Art Festival 1999. Cal Arts CEAIT Electronic Music Festival 2000. Received an honorary mention in Prix Ars Electronica 2001. The O.K Center for Contemporary Art, Ars Electronica Festival 2001. Consolidated Works Contemporary Art Space, Sonic Absorption show. Seattle, WA February-April 2004. Piezoelectricity was discovered by Jacques and Pierre Curie at the same time that Thomas Edison made his major breakthrough in his work on the incandescent light bulb. 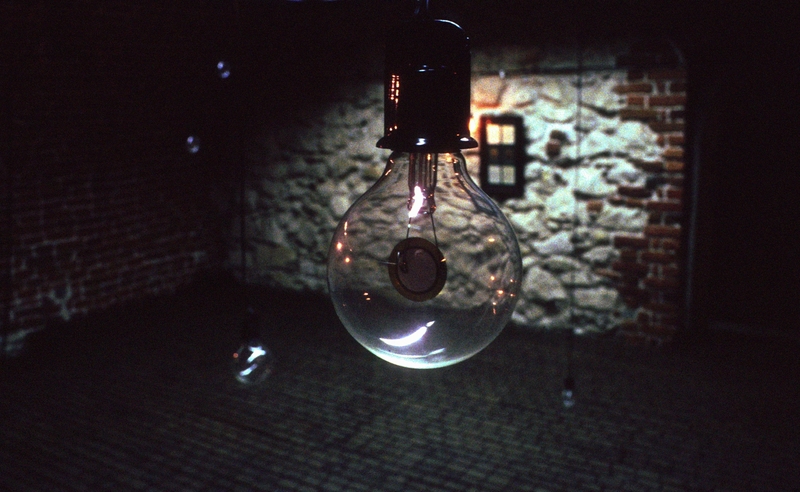 The present installation consists of several incandescent light bulbs and corresponding piezoelectric "sound bulbs". The sound levels of the electroacoustic sound bulbs modulate the luminosity of corresponding light bulbs. The cultural and economic impact of the light bulb has been incomparably greater than that of the piezoelectric element. Yet in both, a small amount of material is activated by electricity, producing two phenomena, the one resulting in sound, the other in light. These sound bulbs allow us to consider the piezoelectric element in the context of the light bulb. By drawing attention to the filament and piezoelectric element, the installation highlights both the technological similarities between them as well as the disparity in their cultural significance. The light bulb is not meant to be looked at, but to illuminate objects and spaces. The loudspeaker is similarly not designed as a focus of visual or sonic attention. It is designed to invisibly reproduce a sonic environment independent of the loudspeaker. In this installation the filament is the focus of visual attention and the piezoelectric element is the focus of sonic attention. In this way, the meaning of the sounds cannot be separated from how they are transduced. The installation attempts to use the cultural significance of the light bulb and the specific technologies of the filament and the piezoelectric element to expand the context in which we understand and experience sound. Potential Difference from Ted Apel on Vimeo.